Mariela has a gift. She’s a survivor, and she’s stubborn. Being one of 10 siblings growing up in a rustic village high in the Andes mountains with no electricity and no running water and having to eke out a living by tending to 200 sheep will give a person that kind of gift. Like so many women who end up in abusive relationships, Mariela clung to the love she thought she found at 18 years old. Her husband served 3 years in jail for beating her up. 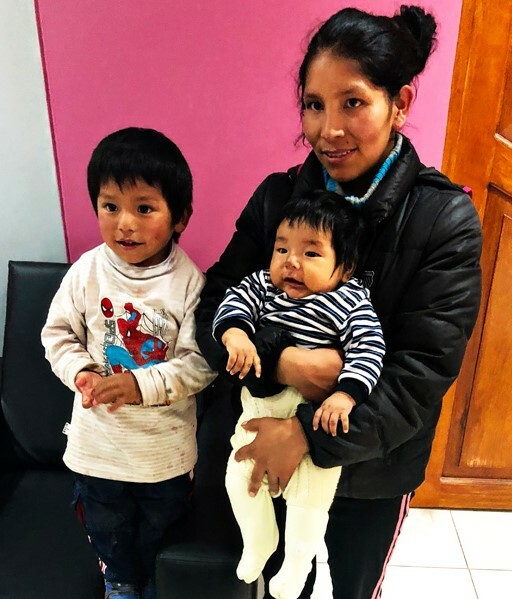 During his absence, Mariela worked at a clothing store 12 hours a day, 6 days a week, walking an hour each way between her workplace and her mud-walled home high in the hills surrounding Cusco. She made the equivalent of $156.25 a month. That wasn’t much money for Mariela and her son to live on. And due to her parents’ crippling poverty, Mariela is also the court-ordered guardian of three of her younger sisters, ages 13, 11 and 8. Her husband came out of jail even more violent. Though he abandoned her shortly after the birth of their second child, he still threatens Mariela to this day. Mariela has an astonishing capacity to see the silver lining in it all, and she will find a way to survive. She. Will. Find. A. Way. Spend a little time with her and she’ll make you cry, then belly laugh, then stand up beside her and join her in saying, “hands to the work.” Mariela is going back to school to become an accountant. She dreams of creating a better life for not only her and her two sons, but her three younger sisters for whom she is responsible. Go HERE to support Mariela and the other mammas of Nuevo Camino!